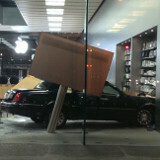 An unpleasant accident has happened on Sunday night in Chicago, when a Lincoln Town Car crashed through the fancy glass facade of the Apple store located in Lincoln Park. There's been one injured person, who have been quickly promptly taken to a hospital nearby in "good condition." The damages done to the store don't seem to be too big, although it will probably remain closed for a day or two until the facade gets fixed. 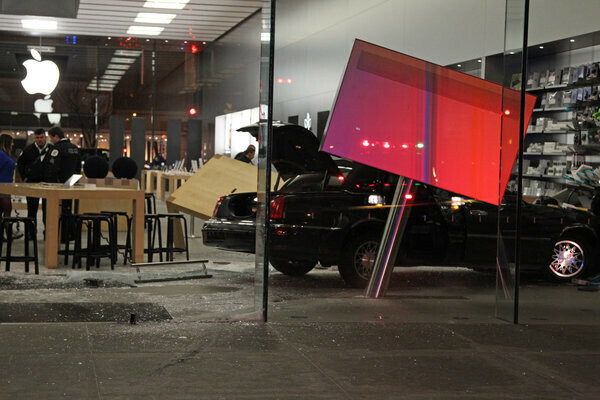 The car smashed into a wall of accessories, but unfortunately, it also managed to hit a table full of MacBooks and a giant screen along the way. It's not clear yet why the driver lost control over the vehicle in such an epic way, but we'll update you should we hear more about the case. Classic. I do hope the one injure person is okay. 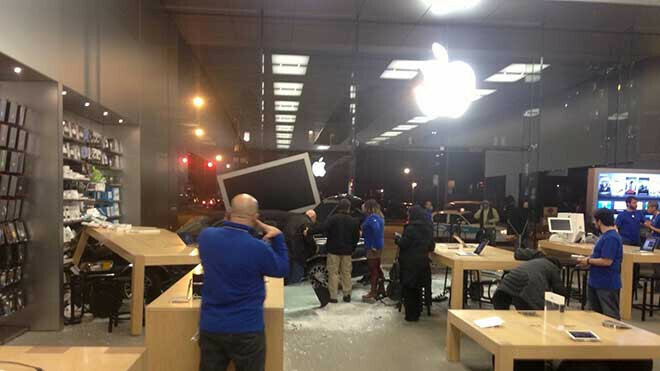 "It's not clear yet why the driver lost control over the vehicle in such an epic way," Obviously that's where apple maps told them to turn! Genius move. Pun not intended.